Score after 20 overs KXIP 190-4, Miller 59(40), Mandeep 33(15); Chawla 3-0-26-1. 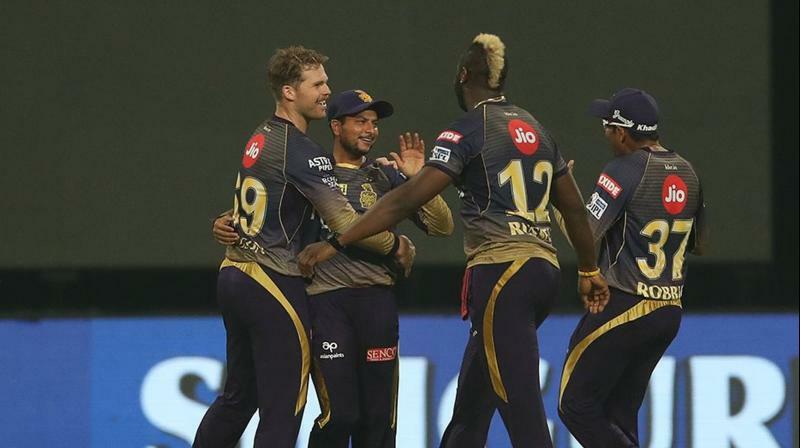 Kolkata: Kolkata Knight Riders clinched a convincing win against Kings XI Punjab as they beat the visitors by 28 runs in their Indian Premier League encounter here on Wednesday. KKR remain unbeaten following this victory. Mayank Agarwal (58) and David Miller (59*) were the only standout performers with the bat for KXIP, with Chris Gayle failing to convert a quick start. Earlier, Robin Uthappa (67) and Nitish Rana (63) had guided KKR to 218-4, along with a knock of 48 from Andre Russell. However, it was a night to forget for debutants Varun Chakravarthy and Hardus Viljoen who picked up their first IPL wickets. WICKET! Dinesh Karthik takes an easy catch as Andre Russell sees off Sarfaraz Khan for an unlucky 13. WICKET! Andre Russell picks the big wicket of Chris Gayle (20) as Prasidh Krishna completes the catch at mid-on. WICKET! Lockie Ferguson strikes as Kuldeep Yadav takes a brilliant catch at mid-off to dismiss KL Rahul. Nitish Rana and Robin Uthappa slammed fifties as they guided Kolkata Knight Riders (KKR) to a massive total of 218-4 against KXIP in their IPL league encounter. Andre Russell, too played his part, but fell short of a half-century. The duo of Uthappa and Rana put up a 110-run stand, which was followed by yet another stand of 67 between Uthappa and Andre Russell. Despite enduring an expensive spell of 1-35 from three overs, Varun Chakravarthy got his maiden IPL wicket when he saw off Rana in the 15th over. FIFTY! Nitish Rana brings up his seventh IPL fifty, his second in asa many games this season. WICKET! Hardus Viljoen gets his first-ever wicket on IPL debut as keeper KL Rahul completes the catch to dismiss Narine for 24 runs. Cheer as HARDUS you can! BREAKTHROUGH! Chris Lynn goes for the maximum, but David Miller is so alert that he does not keep his eye away from the ball to complete the catch, courtesy a Mohammed Shami wicket. KXIP have won the toss and have elected to bowl. Hosts KKR have gone with an unchanged side, while the visitors have made a few tweaks to their team. It will be a battle between third and fourth in the Indian Premier League’s (IPL) sixth match when Kolkata Knight Riders (KKR) host Kings XI Punjab (KXIP) at the Eden Gardens here on Wednesday. While Andre Russell starred in a perfect outing for KKR against Sunrisers Hyderabad (SRH) in Hyderabad, KXIP emerged victorious in Jaipur against Rajasthan Royals (RR) despite the controversial Ashwin ‘Mankading’ incident. One battle to watch out for will be Andre Russell vs Chris Gayle. While Russell played a knock of 49 runs from 19 balls, Chris Gayle’s 79 was the highlight of KXIP’s innings against RR. A former KKR player, Gayle knows Eden Gardens like the back of his hand as he would look to continue his assault on the spin-oriented KKR attack. Russell will be KKR's answer to Gayle as the KKR star also fashioned a sensational win, smashing an unbeaten 49 from 19 balls in their opening fixture against Sunrisers Hyderabad here two days ago. The win saw their star spinner and explosive opener, Sunil Narine, hurt his finger and KKR would hope he is fit in time. Kings XI Punjab: R Ashwin (C), Sam Curran, Varun Chakaravarthy, Mohammed Shami, Nicholas Pooran, Moises Henriques, Hardus Viljoen, Darshan Nalkande, Sarfaraz Khan, Arshdeep Singh, Agnivesh Ayachi, Harpreet Brar, Murugan Ashwin, Chris Gayle, Andrew Tye, K L Rahul, Ankit Rajpoot, Mandeep Singh, Simran Singh, Mayank Agrawal, Karun Nair, Mujeeb Ur Rahman and David Miller.